Create stunning ultra-wide-angle shots with the superb 1 NIKKOR 6.7-13mm f/3.5-5.6 VR. Capture an entire building from street level; a large group of friends without having to back up, or a brilliant sunset with the breathtaking expansiveness it deserves. Featuring premium NIKKOR optics and built-in Vibration Reduction technology, the 1 NIKKOR 6.7-13mm f/3.5-5.6 VR is a versatile travel companion and high-performance addition to your Nikon 1 system. Versatility is a traveler's best friend, and the 1 NIKKOR 6.7-13mm f/3.5-5.6 VR is extremely versatile. 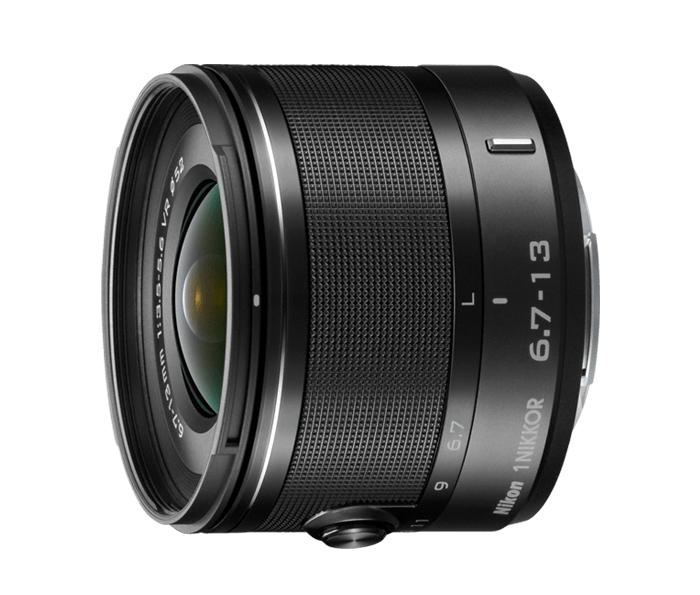 Its 6.7-13mm zoom range (18-35mm equivalent on 35mm format) goes from an angle of view close to what you see with your eyes—to an ultra-wide-angle of view that's great for landscapes, cityscapes, architecture, interior shots or just capturing large subjects from up close. The 1 NIKKOR 6.7-13mm f/3.5-5.6 VR delivers bright, vibrant, crystal-clear views of your world, thanks to premium NIKKOR optics and advanced lens technologies. Built-in Vibration Reduction ensures a little camera shake never ruins a shot, and Aspherical Lens design reduces the ghosting and aberration that can occur in lesser wide-angle lenses. Whether you're shooting still photos or HD videos, you can expect the ultimate in image quality and resolution. Expand your compositional possibilities with 1 NIKKOR 6.7-13mm f/3.5-5.6 VR. At the lens' widest setting, objects in the foreground will appear slightly more emphasized, sometimes even larger than natural. With a little practice, you'll be able to use this effect to draw greater attention to your subject, alter the background-foreground relationship and add drama to a scene. 52mm Circular Polarizer II cannot be used with the supplied HB-N105 bayonet hood. Attempting to forcibly attach either of them while the other one is installed could damage the accessory.